Ri Na Mara USA and Donegal Importers are combining wholesale efforts to bring the organic seaweed cosmetic line American stores. from the west coast of Ireland the purest marine waters in the world! Donegal Importers CEO John Murray announced today "Award winning RÍ NA MARA Natural Organic Irish Seaweed Cosmetics & marine extract products is based in An Spidéal Galway, in beautiful Connemara. 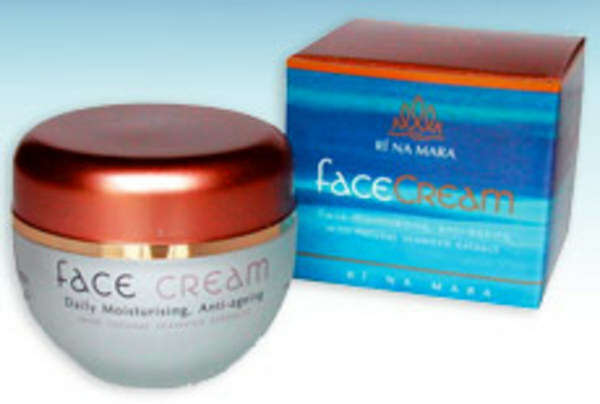 RÍ NA MARA, which is gaelic for "King of the sea", have become Ireland's most popular brand of Luxury marine extract health & beauty cosmetics." Mr Murray went on to say "RÍ NA MARA boutique natural health & beauty range of six seaweed products have become just as popular abroad as in Ireland, particularly the U.S.A.
Rí Na Mara Face cream is ideal for daily moisturising. Combining Seaweed extracts, Aloe Vera and Ginkgo Bilabo this unique formula helps protect against pollution and other free radical damage. It reduces the appearance of fine lines and helps combat premature skin-wrinkling by restoring the skins natural moisture balance. This combined day and night cream with its rich and soft texture, is enriched with vitamins, minerals and amino acids which nourishes and stimulates cutaneous cells leading to intense replenishment, elasticity and radiance thanks to the widely recognised benefits of seaweed. Rich in vitamins, minerals and amino acids, seaweed extracts nourish dry or dehydrated skin and help combat premature skin-wrinkling, reduces UV damage and natural sunscreen protection also protects against UV7 gamma radiation. Directions for use: Apply the smooth cream to face and neck morning and night time. All Rí Na Mara products incorporate the purest natural ingredients from marine or plant origin and are suitable for all ages and skin types. Key Ingredients: Laminaria Digitata, Chondrus Crispus, Fucus Vesicolosus, Aloe Vera, Shea Butter, Apricot Kernel Oil, Ginkgo Bilabo. PH Balanced, Biodegradable, Not Tested on Animals, Free of Animal Derivatives, Free of Mineral Oil / Derivatives." Finally Mr Murray concluded by saying "Ri Na Mara is brought to you in the United States by Donegal Importers. Retail Stores please feel free to contact us for wholesale pricing."